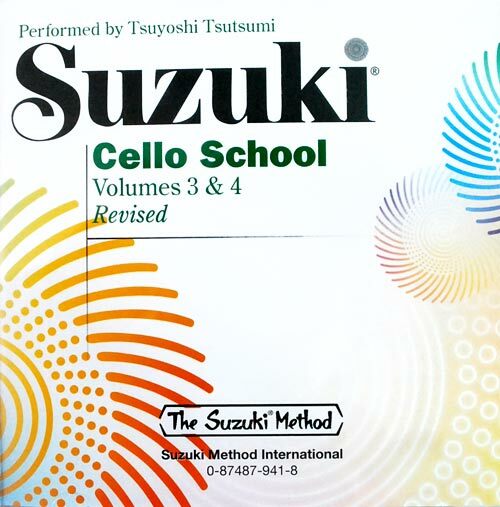 CD accompaniment for Suzuki Cello School Volume 3 & 4. Titles: Berceuse, Wiegenlied or Lullaby, Op. 98, No. 2 (F. Schubert) * Tonalization: The Moon over the Ruined Castle (R. Taki) * Gavotte (J.B. Lully) * Minuet from Sei Quintetti for Archi No. 11, Op. 11, No. 5 in E Major (L. Boccherini) * Tonalization: The Moon over the Ruined Castle (R. Taki) * Scherzo (C. Webster) * Minuet in G, Wo0 10, No. 7 for Piano (L. van Beethoven) * Gavotte in C Minor, Gavotte en Rondeau from Suite in G Minor for Klavier, BWV 822 (J.S. Bach) * Minuet No. 3, BWV Anh. II 114/Anh. III 183/Anh. II, 115 (J.S. Bach) * Humoresque, Op. 101, No. 7 for Piano (A. Dvorak) * La Cinquantaine (Gabriel-Marie) * Allegro Moderato from Sonata I in G, BWV 1027 for Viola da Gamba (J.S. Bach), Sonata in C Major, Op. 40, No. 1 (Allegro, Rondo grazioso) (J.B. Breval) * Adagio and Allegro from the Sonata in E minor, Op. 1, No. 2 (B. Marcello) * Minuets from the Suite in G Major, BWV 1007 (J.S. Bach) * Tonalization * Chanson Triste, Op. 40, No. 2 for Piano (P. I. Tchaikovsky).